to sue the Senate President, Bukola Saraki, if he fails to mention one aspirant that gave him money to influence his decision. 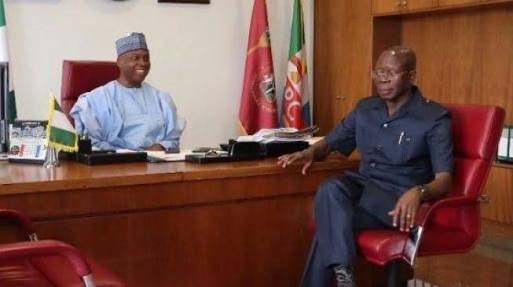 Saraki had said that Oshiomole had no moral grounds to remain in office following talks by people in his party that he received money from some persons to influence the decision of the National Working Committee in their favour. But Oshiomhole in a statement on Thursday by his Chief Press Secretary, Simon Ebegbulem, described the comment by the Senate President as unwarranted, pathetic and irresponsible resort to petty politics. The statement read, “It is sad that Saraki, who just woke up from slumber occasioned by his crushing defeat at the Port Harcourt presidential primary election of his party, could degenerate to such a low level. “It is equally sad, but not unexpected, that Saraki, who is politically drowning, would make such libelous comments against the national chairman of the APC. And I challenge Saraki to mention the name of one aspirant that gave money to the national chairman or we file a legal action against him. However, Saraki, said he was not bothered about Oshiomhole’s threat to sue him, adding that it was an empty boast. He stated that rather, he and other Nigerians were waiting to see how President Muhammadu Buhari would handle the allegations of bribery levelled against Oshiomhole over the conduct of the primaries of the party. Saraki, in a statement by his Special Adviser (Media and Publicity), Yusuph Olaniyonu, in Abuja on Thursday, said, “Nigerians are waiting to see how the President will handle the serious allegations against his party chairman. We expect the President with his anti-corruption campaign to institute a thorough and transparent investigation into the allegations against his party chairman.